ST. GEORGE — Strong winds are expected to continue to billow across Garfield, Kane and Washington counties through Sunday night. Shaded areas denote region subject to wind advisory. Map generated Mar. 5, 2017, at 4:53 p.m. | Image courtesy of National Weather Service, St. George News | Click on image to enlarge. The National Weather Service in Salt Lake City issued a wind advisory Sunday afternoon warning of strong southwest winds likely to impact highway travel. 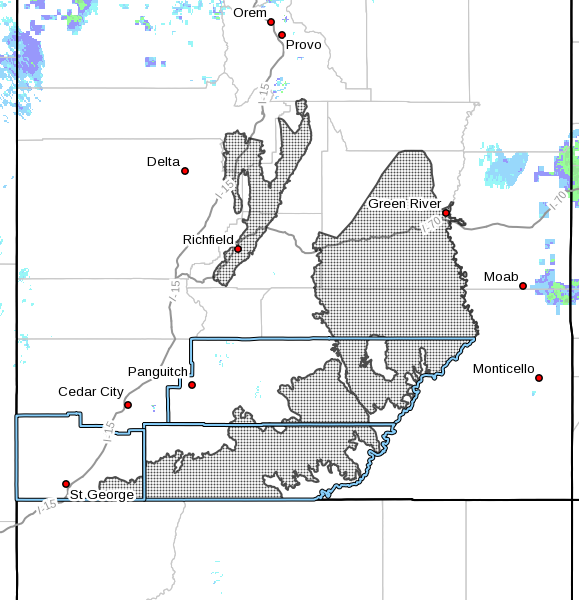 The advisory affects the San Rafael Swell, Sanpete/Sevier Valleys and South Central Utah, including the cities of Green River, Hanksville, Manti, Richfield, Kanab and Escalante. Strong southwest winds of 25-35 mph with gusts around 50 mph will continue across the area through early Sunday evening. A cold front will sweep south through central and southern Utah Sunday evening. Winds will remain strong for a few hours after the front passes before decreasing late Sunday night. Strong crosswinds may cause hazardous travel especially for high-profile vehicles and those towing trailers. Wind sensitive operations may be impacted. The advisory calls for sustained wind speeds of at least 31 mph or gusts of 45 mph. Motorists in the advisory area should be prepared for sudden gusty cross winds which can make driving difficult. Strong gusts have blown through the state over the weekend, in one case causing a semitractor-trailer to topple. The semi tipped over in the westbound lane of Interstate 80 near milepost 79 Sunday morning. 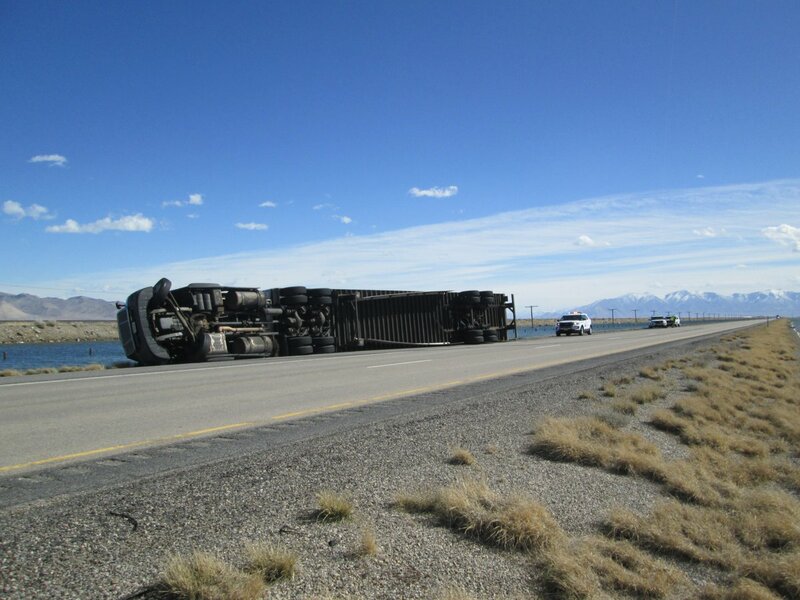 The trailer was empty and the driver did not report any injuries, Utah Highway Patrol Sgt. Jalaine Hawkes said. “The semi-truck just didn’t have enough weight with an empty trailer and basically blew over,” Hawkes said. Gusts of 45 mph were recorded in Cedar City, and as of 10:30 a.m. the National Weather Service recorded peak gusts of 56 mph in parts of the state. I-70 as well as portions of US-6 and 89 will be affected by strong crosswinds. Those traveling state Route 12 into Bryce Canyon National Park can expect delays due to roadwork relating to a landslide at the end of last month. Motorists traveling State Route 30 to Nevada state Route 233 will need to use an alternate route to Nevada as SR-233 is closed in both directions due to flood damage in February. According to Nevada Department of Transportation’s website, SR-233 remains closed between Nevada Interstate 80 and the Nevada-Utah state line as NDOT makes repairs to extensive flood damage. “Numerous areas of the roadway were washed away by heavy flood waters, with as much as 12-foot deep caverns carved through the road,” NDOT states. U.S. Highway 191 is closed at the Utah-Wyoming border.